It’s been awhile since this blog was updated and I hope the next few posts will make up for it. A recent trip to Tokyo allowed me to try a few new restaurants worthy of this blog. 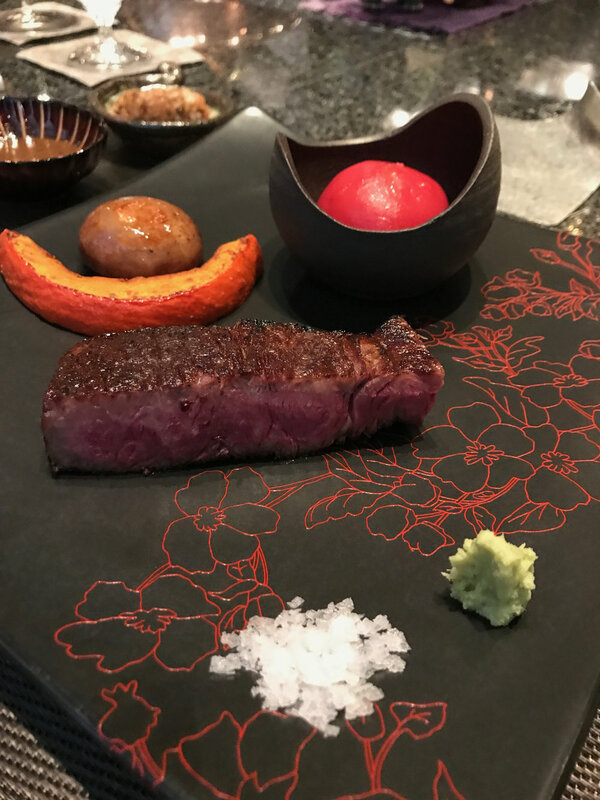 The first is this top-notch Teppanyaki restaurant nestled on the 3rd floor of an unassuming building in the quiet neighborhood of Azabu-Juban. 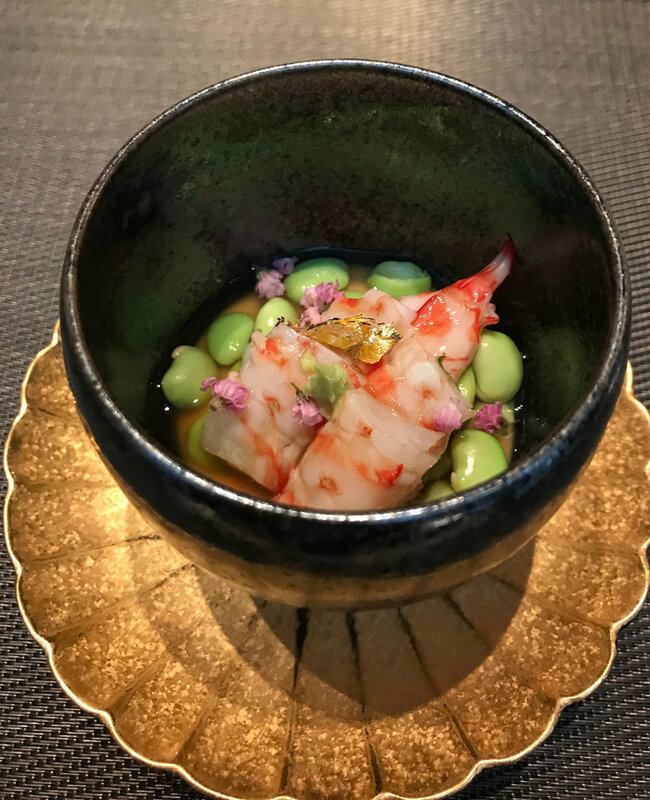 The restaurant is run by chef Yoshida and his wife, and he is part of a series of new emerging younger chefs in Japan with excellent skills and much more relaxed attitudes compared to their older counterparts. Most famous restaurants with older chefs in Japan don’t allow pictures to be taken of their food for reasons I have yet to understand. At Ishigaki Yoshida however, cramming your instagram feed with pictures of their magnificent array of dishes is most welcome. Yoshida’s wife will even come around and help set the background for you. I found this to be very refreshing. Believe me, I have failed to write about many amazing restaurants because of this no-picture rule. The courses at Ishigaki Yoshida don’t come cheap. The starting price for their steak course is 25.000 yen and it goes up to 50.000 yen. 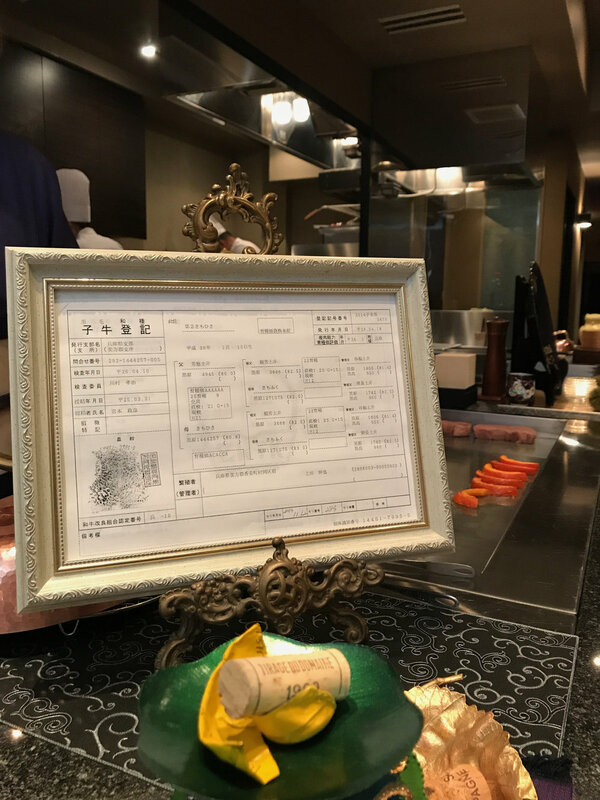 For a more detailed menu you can visit their website at http://www.ishigaki-yoshida.jp. There is an English translation of the menu. At the time of our visit there was a special 42.000 yen menu that involved some Tasmanian Black Truffles. Being a truffle fan, it was only natural that we decided to try that course. First dish on the menu. A very refreshing cold cawan mushi with shrimp and a dash of magnificent gold leaf on top. The second course was the most exciting because it involved two of my favorite things. Truffle and Sea Urchin. I was so enchanted by this egg omelette with sea urchin and tons of truffle on top that I actually forgot to take pictures. I had to reach into my snapchat memories to dig out a picture of this dish and ended up finding this video that I might as well share with you. Please ignore the caption (yes, our it was a Monday and yes, Ishigaki Yoshida isn’t usually open for lunch but was kind enough to open for our group). Notice the rain of truffles ?. My favorite dish. Next course might draw some controversy. Shark fin covered with charcoal breadcrumbs. Interesting dish, never tried it before but somehow I think that shark fins are better in broths. Now, we move on to the beef. A beef so special you are presented with a chart of the cows history up to their great grandparents with names included. Not exactly sure I like this because it gave our cow a name and a history and I suddenly felt sorry for it. The chart of our cows name and ancestry. 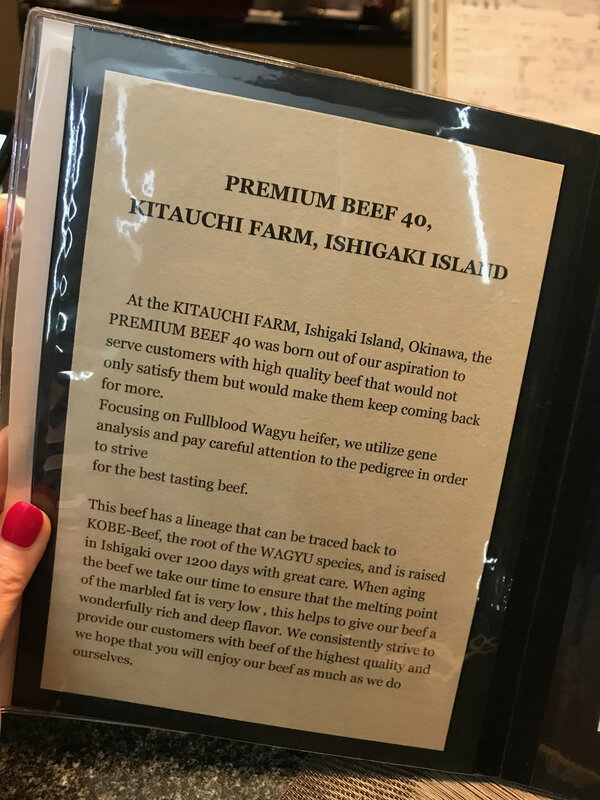 The cow that chef Yoshida uses comes from Ishigaki in Okinawa called Kitauchi Premium Beef. We were presented with an album that explained the beef to us. The first meat dish is a cut of this premium beef cooked to perfection with a side of the sweetest tomato I ever tasted. It comes with two sauces, a plum sauce and a steak sauce that compliments the taste. I like to eat Japanese steak the simple way, with a dash of salt and wasabi. The next dish wasn’t in our menu and we ordered it extra because Yoshida is very well known for its black sandwich. 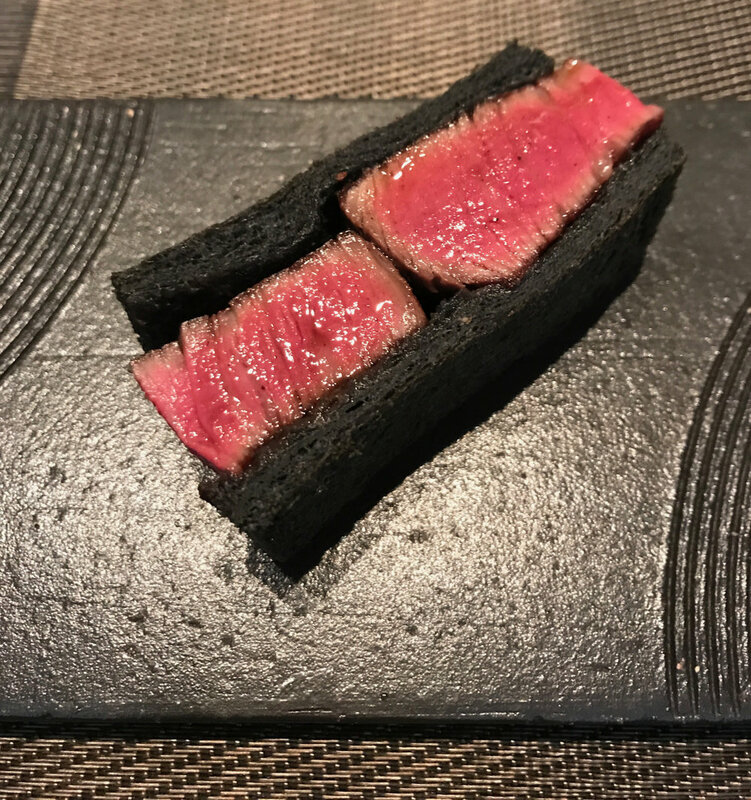 A slice of steak with charcoal bread. 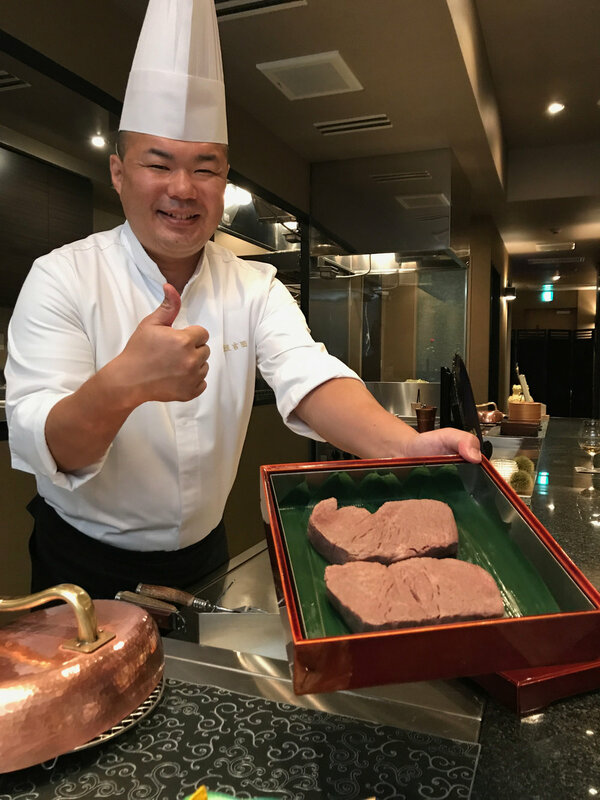 The reason Chef Yoshida uses charcoal bread is because the use of butter bread takes away the beautiful taste of the beef. By this time I was getting full and struggling to finish my sandwich only to find that there was another rice dish coming. 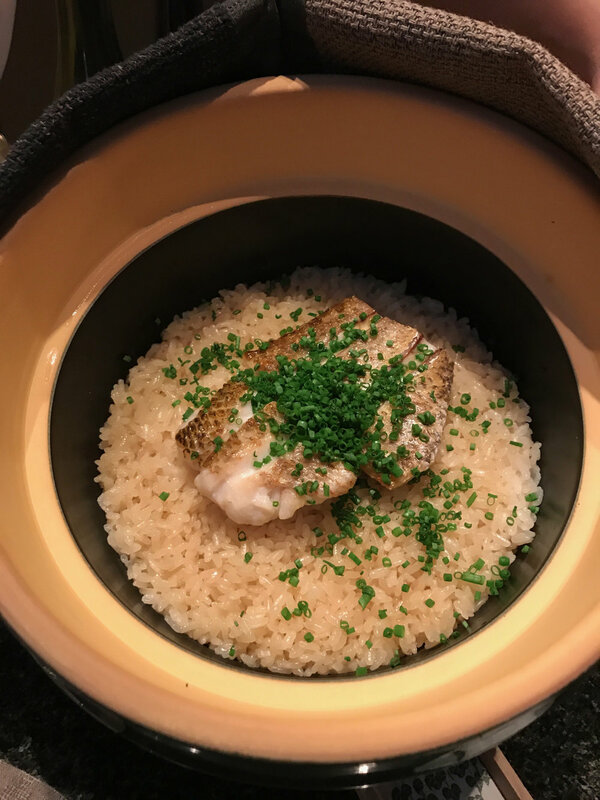 A rice pot with fish that looked too good to pass, especially when some truffles were added to it. I loved the rice. It was something new to me and I found the taste very interesting. For desert, chef Yoshida served a very refreshing pear with Vanilla ice cream and ginger flavored shaved ice that was the perfect closure. The tea and coffee that followed was also meticulously prepared. If you ask me if this was the best Teppanyaki course I have ever tried in my life, I would have to answer that well, maybe I’ve had better. But these things are always a matter of taste. It certainly won’t surprise me if you tried this restaurant and came back screaming that it was your best meal ever!. I definitely have the utmost respect for chef Yoshida’s passion and skill towards perfecting his dishes and also his warm and relaxed attitude that made dining with him pure joy. I can say this… this meal was definitely something extraordinary.